Fifteen students in wonderfully white outfits are strewn about the courtyard next to Freud Playhouse. Each one embodies a character of his or her own choosing. One woman’s hand is lightly pounding on a door she leans on. A few stragglers crouch just outside the entrance. Sounds erupt sporadically, sometimes simultaneously. It’s Tuesday evening, and the group is holding its third and final rehearsal for a pre-performance installation before the premiere of Meredith Monk & Vocal Ensemble’s On Behalf of Nature, this weekend as part of the Center for the Art of Performance at UCLA (CAP UCLA) season. 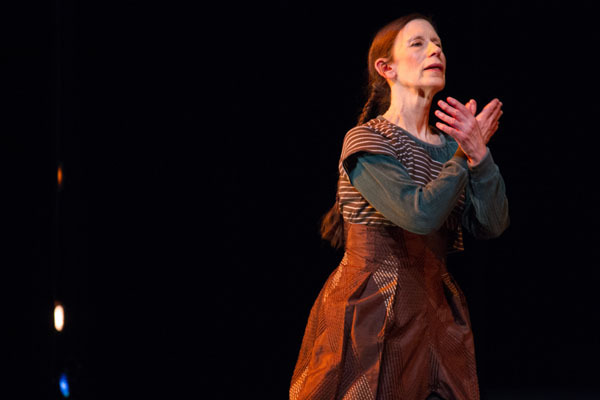 Despite the 47-degree temperature, Monk and vocal ensemble member Ellen Fisher walk around slowly, offering individuals notes on movement and sound. Monk appears to be floating in her colorful, quilted, floor-length coat with images of clouds around her shoulders.